Bouchaine is the oldest continually operated winery in Carneros. It was first planted to vines and orchards by the Carneros legend, Boon Fly, as part of a larger tract in the 1850s. A couple of owners followed, including Italian immigrant Johnny Garetto and the Beringer Brothers. In 1981 the winery was acquired by Burgundian enthusiasts Gerret and Tatiana Copeland and a group of nine other partners. When they came upon the property, the vines had been pulled out and a derelict shed stood on the property. The christened the property Chateau Bouchaine after the maiden name of the general partner. A decade later, the investors lost interest in the project and the Copelands acquired the entire property. The Copelands replanted vineyards and bought more land, including the Garetto hills. A massive renovation of Bouchaine was undertaken in 1995 and in 2002 Michael Richmond was hired as winemaker and general manager. Michael Richmond is a veteran of over 30 years in the winemaking business. He co-founded Acacia Winery in Carneros and later managed Carmenet Winery for Chalone. He is one of the co-founders of the Steamboat Pinot Noir Conference in Oregon. Andrew Brooks, the son of Larry Brooks, the first winemaker Richmond hired in 1979 when he founded Acacia Winery, joined Bouchaine as assistant winemaker in 2007 and left Bouchaine when Richmond retired. In 2015, Richmond retired after 13 vintages at Bouchaine, and Chris Kajani was hired as the winemaker and general manager. She was previously at Saintsbury for eight years. Her first dirt-to-bottle vintage was 2015. Paul Hobbs was hired as consulting winemaker and Erik Goodmanson as assistant winemaker. The Copelands have a focus on the arts and sponsor the Bouchaine young Artists Series, the only musical event at Festival del Sole that is free to the public. They also focus on open land preservation and animal rescue. 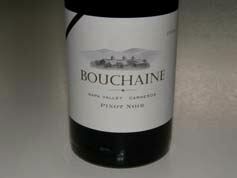 Bouchaine Vineyards wines are available on the website. There is also decent retail distribution. The winery is open to visitors daily from 10:30-4:00. The address is 1075 Buchli Station Rd, Napa. The phone is 800-654-WINE.